Too many hats and an overhauled map may be to blame. Image taken from key art for the Elements of the Endless Plane set for Faceless Void by blossomalex. Dota 2 players never wanted stutter-step like this. Over the last several months, the community surrounding Valve’s popular MOBA has launched an avalanche of complaints about a massive drop in the game’s frames-per-second performance. 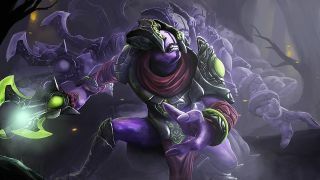 The issues became most prominent after the release of the 7.00 patch on December 12, which featured a massive design overhaul and the first Dota 2 hero to not have a counterpart in the original Warcraft III mod. While there’s collective agreement across sites such as Reddit and Twitter that 60fps should be the bare minimum for remotely-decent play, many users are having issues even reaching a basic 30fps. Users report that high-end computers that typically run at 140fps have often dipped down towards 60fps, sometimes lower in more intense moments. These issues may tarnish the game’s reputation for being accessible on low-end computers, particularly as Dota 2 rises as an esport alongside similar, well-tuned games. This is an issue for not only everyday players but also pros, who require precise input and responsiveness in clutch situations. Pros and streamers such as Arteezy, Limmp, and MoonMeander aired their concerns over Twitter. EternalEnvy complained late December that during teamfights, his framerate would cut nearly a third: from 144 to a mere 50. As fans raise their expectations for esports production quality, tournament organizers need the 60fps with visually-pleasing settings, typically “High” or “Ultra,” to execute increasingly higher-quality video streams. Because of these widespread complaints, the words “performance patch” now make frequent appearances on the Dota 2 subreddit’s front page. Since mid-December’s patch, at least 150 complaint threads (manually counted, and rising) have been posted on /r/dota2. The issue of low FPS has even become part of the subreddit’s comedy culture, known for its absurdist, blunt humor. One thread starts, 'TIP: How to tell when enemies use certain abilities' and lists some audio-visual indicators of characters’ abilities. The punchline: “Wukong's Command (Monkey King) - your game will freeze and your FPS will dip below 20 for a second or two.” This is a reference to Monkey King's ultimate, which summons several statues in a circle to attack opponents. Players find that using this ability causes lag, making big teamfights nearly impossible to navigate. The largest thread was created by esports match observer Pimpmuckl as a “megathread” to aggregate, organize, and discuss the largest issues facing the community. Edited into the main post are both complex and simple ways improve FPS, which grew too big for the post itself and had to be carried over into a public Google Doc. Another user put up an extensive list of bugs, including a few lag and FPS issues, some of which may have been fixed since that initial posting. The notion of community-sourced solutions is familiar to both Valve and the Dota community, and Pimpmuckl has been sharing advice with players and pros alike. He's using his general computing knowledge to help others to bring their computers up to par. While Valve hasn’t provided a formal explanation for these issues, Pimpmuckl tells us that a combination of emerging factors from increasing numbers of particle effects for hats to the 7.00 map overhaul may be potential parts of the issue. He believes that these increasingly-complex parts of the engine may cause the CPU to get overworked, delaying commands called 'draw calls' from being sent from the CPU to the graphics card. Unfortunately, without the official word from the developers, there’s no way of knowing what specifically causes this to happen within the game engine. As players attempt to play through the lag, Valve remains mum on the conundrum. However, hope may emerge as the Bellevue snow melts. Twice, the developers have released a 'Spring Cleaning' update once in 2014 and again in 2016, each in the midst of player bug complaints. The former was the first such patch after the game left beta, and each focused mainly on unintentional interactions between players. A dedicated patch could bring a lot more good news. Of course, having the devs quickly attack issues as massive as these may be risky. In all fields of programming, shortcuts that can improve performance can have major implications for other unexpected parts of the game, which could drive away a good chunk of the game’s 13 million unique users. Therefore, a performance patch may not be as easy as “just fixing FPS,” and given the lack of a timeline from Valve, haste shouldn’t be expected. For now, Pimpmuckl shared his best quick tips for fixing FPS issues. If you believe your graphics card is working up to par and want to help your CPU’s performance, turn off high quality water. If that doesn’t do the trick, turn down shadow settings. On the other hand, for graphics cards that are struggling, settings such as parallax mapping, tree wind and ambient occlusion should be the first to go. Adjusting the render quality should be a last resort as it can put more pressure on the CPU. And, while Vulkan should theoretically help with some issues, it seems to have more bugs than its DirectX 9ex counterpart. While Valve hopefully works on a solution, players are left praying that they're not left lagging too long.